Grilled Beer Can Chicken is a fun and different way to achieve perfect grilled chicken that will have your friends and family thinking you are a prize-winning BBQ Pit Master! It’s time to fire up the grill and invite family and friends to come over for a cookout to help celebrate Independence Day, America’s birthday! 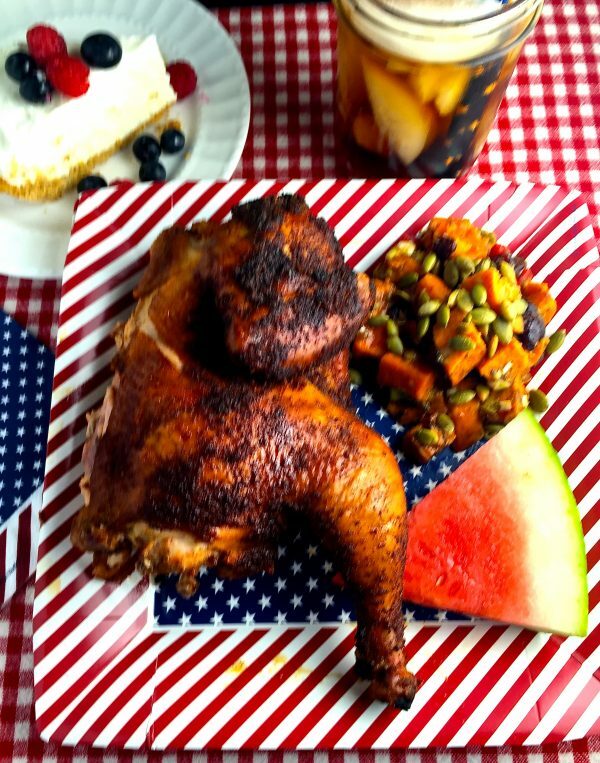 And today I will be sharing the final and possibly the most exciting dish included in my tasty Fourth of July menu, hot-off-the-grill Beer Can Chicken, to go along with Roasted Sweet Potato Salad, and a fantastic Frozen Lemonade Pie topped with fresh summer blueberries and raspberries or my patriotic Red, White and Blue No-Bake Icebox Cake. My Fourth of July menu wouldn’t be complete without grilled chicken, and I have a fascinating, fun and really delicious way to cook chicken on the grill for your Fourth of July cookout. It’s a different way to achieve perfect grilled chicken that will have your friends and family thinking you are a prize-winning BBQ Pitmaster! 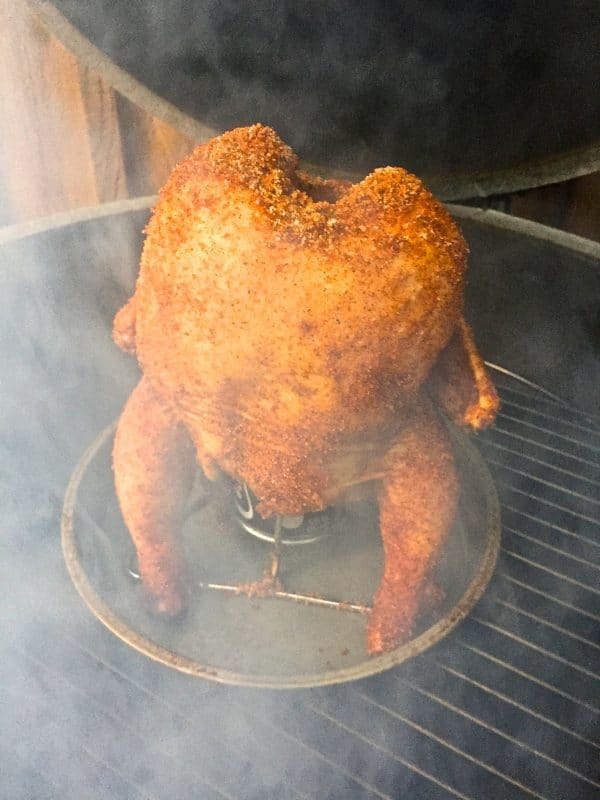 The secret: an open can of beer or another carbonated beverage is inserted into the cavity of a chicken, which is then cooked upright on the grill. Besides being out of this world tender and delicious, the chicken makes a great conversation piece for your Fourth of July cookout. Grilled chicken is one of my top 10 most favorite foods; I dearly love it. Nothing brings out the flavor of chicken like grilling and this easy grilled chicken recipe is out of this world delicious. The smoke from the charcoal adds a taste that you can’t get with any other cooking method. And, not surprisingly, I have quite a few grilled chicken recipes on my blog. If you are like me, then I know not only will you love this Beer Can Chicken recipe, but you will also love these recipes: Grilled Chicken with Peach Glaze, Grilled Chicken Skewers with Tomato Relish, Grilled Teriyaki Chicken with Teriyaki Marinade, Simple Lemon Whole Grilled Chicken, and the Best and Easiest Grilled Chicken. Be sure to check them out too! 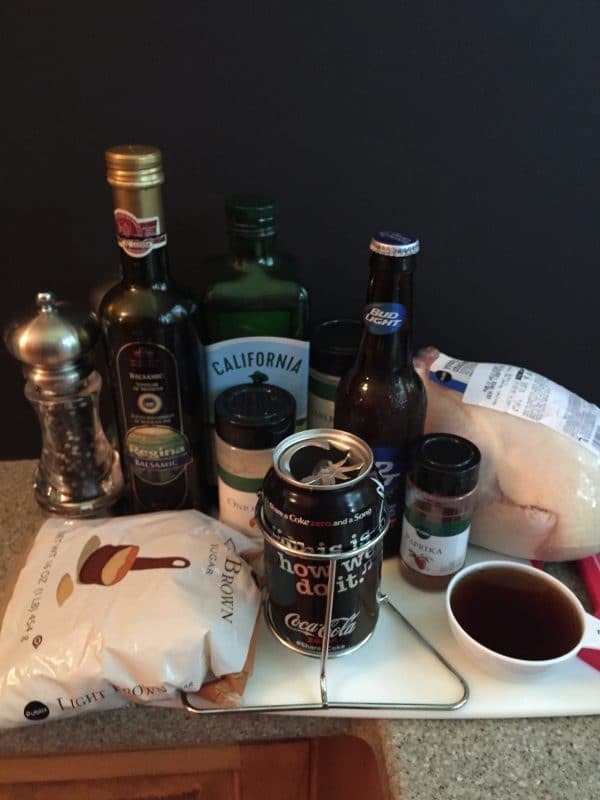 The ingredients for Grilled Beer Can Chicken are brown sugar, paprika, salt and pepper, garlic powder, onion powder, cayenne pepper, a chicken, beer or another carbonated beverage in a can, apple juice or apple cider, olive oil and balsamic vinegar. 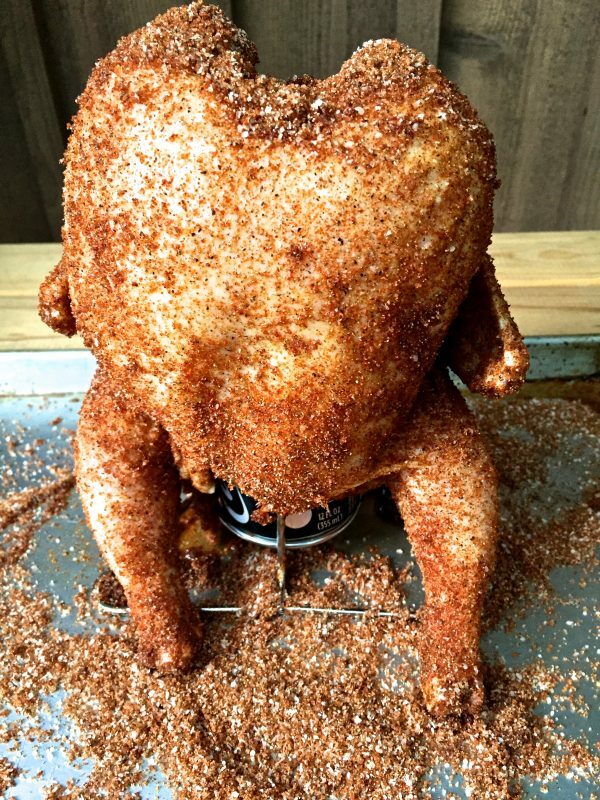 Slide the chicken over the beer can, or if you are using a vertical beer can chicken roaster, place the can into the holder and slide the chicken over the can and holder. 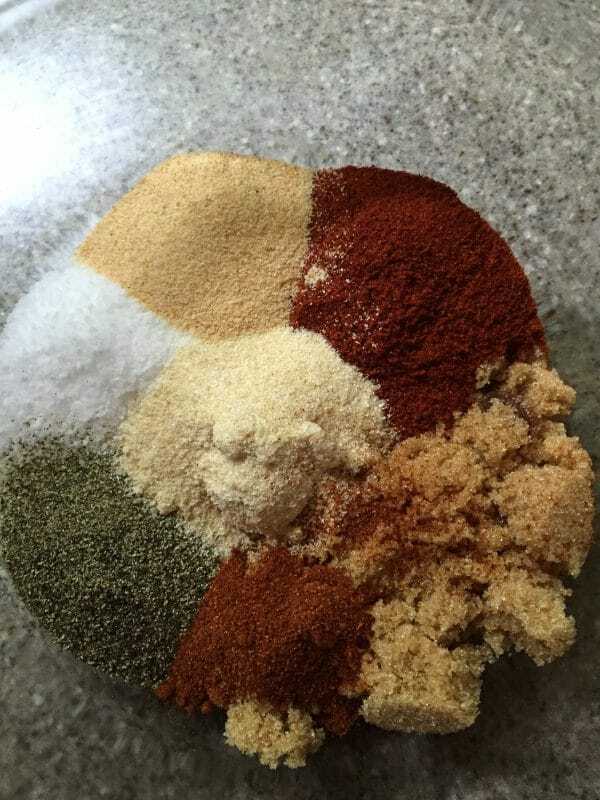 To make the rub, combine all ingredients in a small bowl and mix well. Apply the rub all over the chicken, even inside the cavity. Work the mixture under the skin wherever possible. Cover the chicken and let it marinate for at least 30 minutes at room temperature. In the meantime, prepare your grill for direct grilling and preheat to 375 degrees. 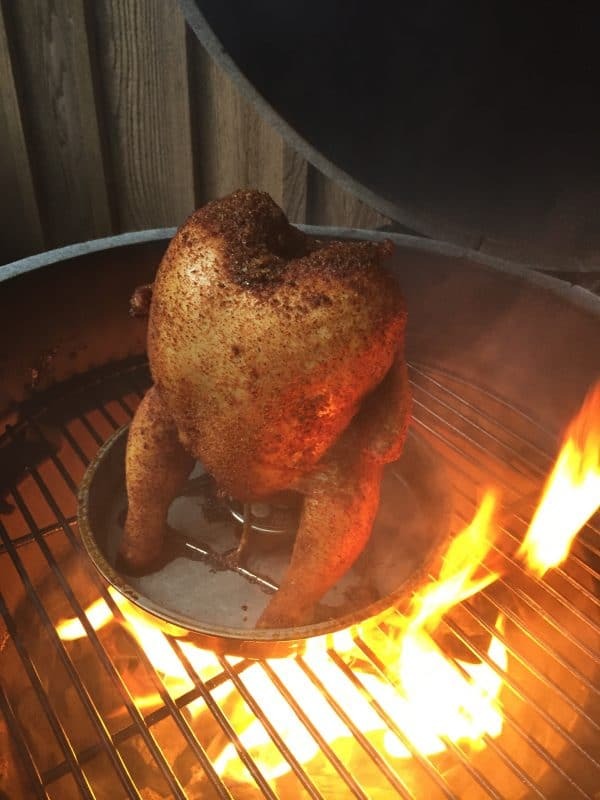 This chicken was grilled using a Green Egg Grill, but any grill with a lid will work and the directions will be the same. When the grill is ready, pour half of the beer or other carbonated beverage into a spray bottle. Add the apple cider or juice, olive oil, and balsamic vinegar and shake well. Carefully place the chicken and the vertical roaster on the grill grates. Spray the chicken with the mixture in the spray bottle and close the grill lid. Cook for about 20 minutes or until the chicken starts to brown all over. Using heavy-duty oven mitts, carefully lift up the chicken (still sitting on the vertical roaster) and place a drip pan under the roaster to catch the drippings. (I usually use a pie plate or cake pan.) 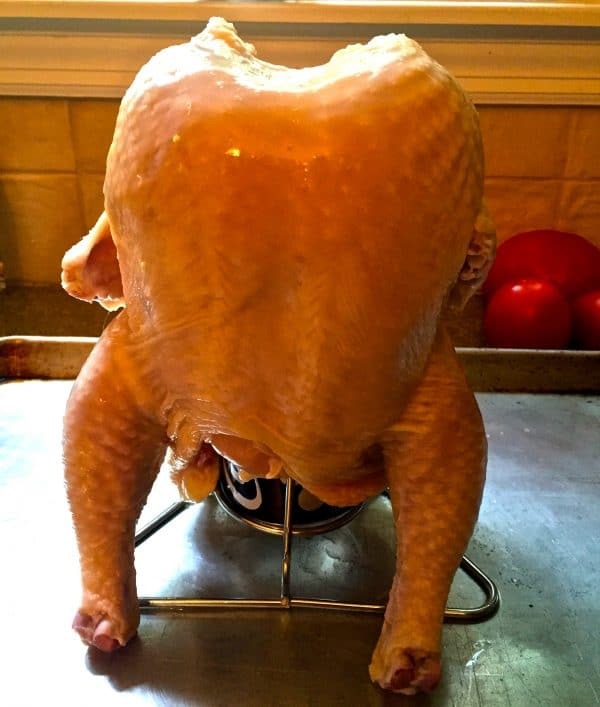 Spray the chicken again and close the lid. Cook for approximately 45-60 more minutes, spraying the chicken every 15 minutes or so until the internal temperature of the thighs reaches 165 degrees. Have a large pan or dish close and again, using heavy-duty oven mitts, carefully lift the chicken and vertical roaster off the grill. Very carefully remove the chicken from the vertical roaster and can and place in the pan. Use extreme caution here; the can and liquid inside are very hot! Spray the chicken once more, cover loosely with foil and let rest for approximately 10 minutes before serving. 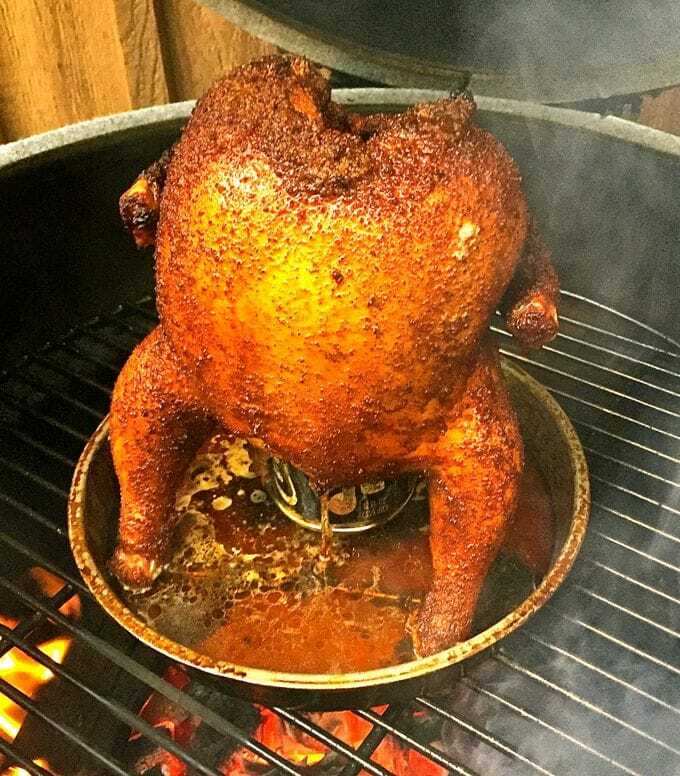 Grilled Beer Can Chicken is a fun and different way to achieve perfect grilled chicken that will have your friends and family thinking you are a prize winning BBQ Pitmaster! When the grill is ready, pour half of the beer or other carbonated beverage into a spray bottle. Add the apple juice or apple cider, olive oil, and balsamic vinegar and shake well. Using heavy-duty oven mitts, carefully lift up the chicken (still sitting on the vertical roaster) and place a drip pan under the roaster to catch the drippings. (I usually use a pie plate or cake pan.) 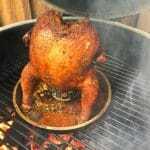 Spray the chicken again and close the lid. Cook for approximately 45-60 more minutes, spraying the chicken every 15 minutes or so until the internal temperature of the thighs, reaches 165 degrees. I’m sorry for the confusion and thank you for letting me know. I’ll correct it right away. You can use either apple juice or apple cider in this recipe. The caloric content listed is for how much chicken? Hi Kristen, the calories listed are for 1/4 of the chicken. I hope you enjoy it! Yes, I’ve never done it, but I don’t see any reason it wouldn’t work to cook it in the oven. You will miss that smokey grilled taste, but I think it still be delicious! You will have to remove your upper oven racks. 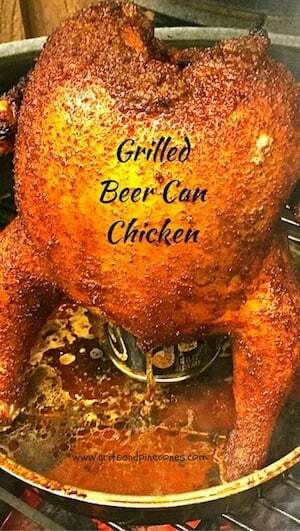 Also be sure to place the chicken and beer can in a rimmed baking pan to catch the juices. Hi Laura, I allow it to cool and throw it away.